In the end, May’s government survived to fight another day, as members of Parliament (MPs) voted in her favor by a margin of 325 to 306. This is the second no-confidence vote the prime minister has faced in a matter of weeks. On Dec. 12, May survived a vote of no-confidence, orchestrated by disgruntled MPs from within her own Conservative party, by the margin of 200-117. This vote, however, had the potential for far more significant implications. If May had lost the vote, she would have likely been forced to resign, with a general election to follow soon after, putting the ultimate fate of Brexit even more in doubt. 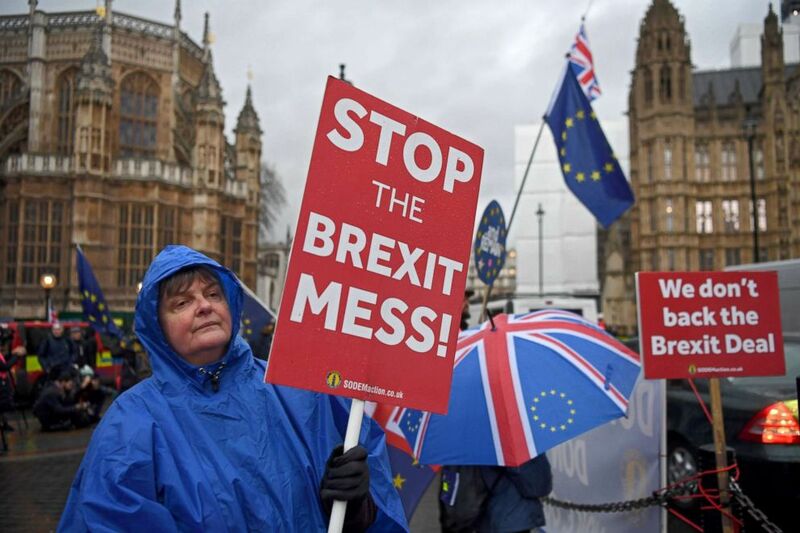 Brexit protesters shelter from a rain shower outside the houses of parliament in London, Jan. 16, 2019. 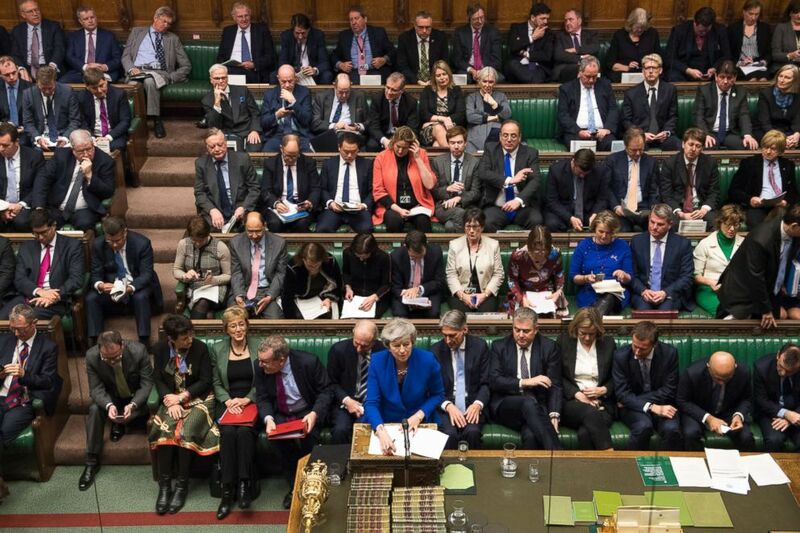 Although 118 MPs in May’s own Conservative Party voted against her Brexit deal on Tuesday, the prime minister was expected to survive the no-confidence vote. Conservative MPs rallied behind her Wednesday, despite opposing the Brexit deal on Tuesday. The vote of confidence suggests they feared the prospect of a general election more than the prospect of May remaining in charge of the Brexit process. May has held onto power, but the future of Brexit is still up in the air. After her heavy defeat on the Brexit deal on Tuesday evening, May now has until Monday to propose another deal to Parliament. So far there are no indications as to what changes May plans to make to her original failed Brexit deal. However, after Tuesday’s defeat, the prime minister said she would listen to politicians’ concerns and try to seek better terms with leaders of the European Union. In the lead-up to Tuesday’s crushing defeat, May’s deal was criticized by politicians and pundits on all sides of the political spectrum. Some argued May’s deal would mean that the U.K. would be too closely tied to the EU for the indefinite future, while others suggested the deal would damage the economy and lead to job losses. 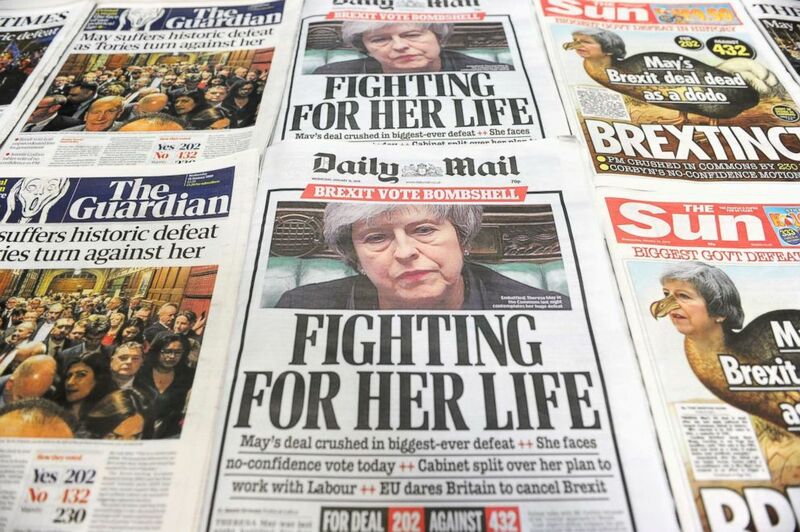 An arrangement of daily newspapers photographed in London on Jan. 16, 2019 shows front pages reporting on the UK parliament’s rejection of the government’s Brexit deal. Britain’s Prime Minister Theresa May talks during a debate before a no-confidence vote raised by opposition Labour Party leader Jeremy Corbyn, in the House of Commons, London, Jan. 16, 2019. With more than two-thirds of parliament voting against May’s original Brexit deal on Tuesday, the defeat was the biggest government loss in a parliamentary vote in more than 100 years, according to the Institute for Government, a U.K. think tank. May has spent the better part of two years negotiating a Brexit deal with EU leaders. 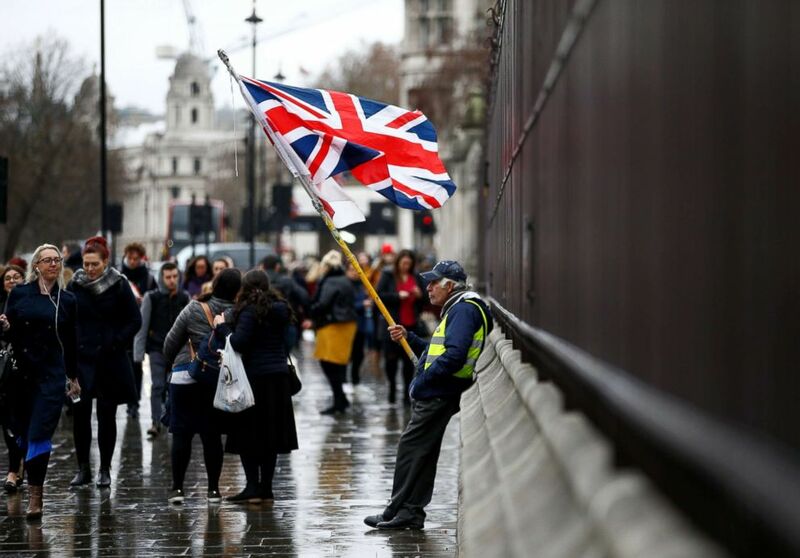 People walk past a pro-Brexit protester outside the Houses of Parliament, after Prime Minister Theresa May’s Brexit deal was rejected in London, Jan. 16, 2019. Jean Claude Juncker, president of the European Commission, the EU’s main political body, expressed his “regret of the outcome of the vote” on Tuesday evening. The deadline for the U.K. to leave the European Union is March 29. If Parliament cannot agree to a deal or the deadline isn’t extended, the U.K. could leave the EU with “no deal,” which most politicians and businesspersons agree would be disastrous. 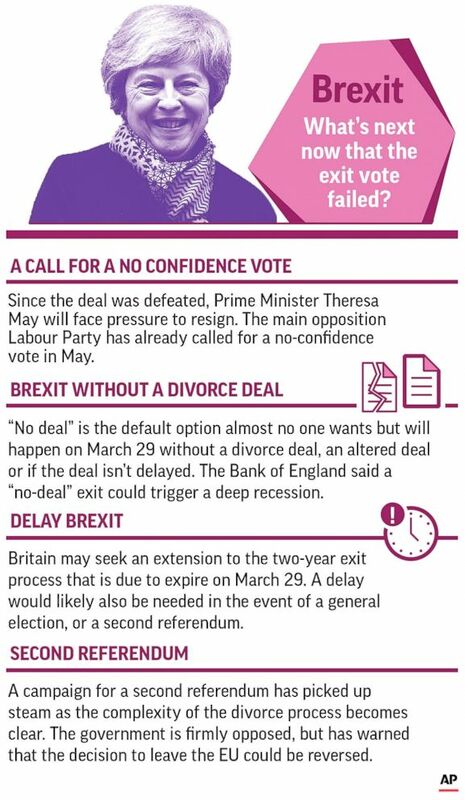 A graphic explains the various Brexit options now that Theresa May’s proposed exit deal failed its vote.